It was the terrace of the Pilgerhaus in Tabgha in the Gallilean region of Israel. I was there on a pilgrimage with 19 other clergy folks at the start of two weeks that was renewing and transformative. 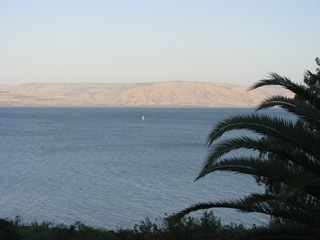 I can’t say enough how wonderful the fully express how good that time in Galilee was for me . . . both in the relationships built and in the sites seen. What I know is that I left having experienced something of God in a new way, and if someone called me tonight with an invitation to go back, I would be out of here in a flash. It’s been a long year since then, a good year, but a tiring one. Sitting on the terrace of the Pilgerhaus with a cold Taybeh in one hand, a bowl of olives on the table, and a good book to read with the cool breezes off the Sea of Galilee sounds mighty fine. Rest and renewal will come. There will be time to sit and simply be. But when and wherever I do, it’s likely that there will be a particular vision of palm trees, banana plantations, and a lake with hills in the distance that will be in my mind. Next Post Do United Methodists Want to BE Disciples?